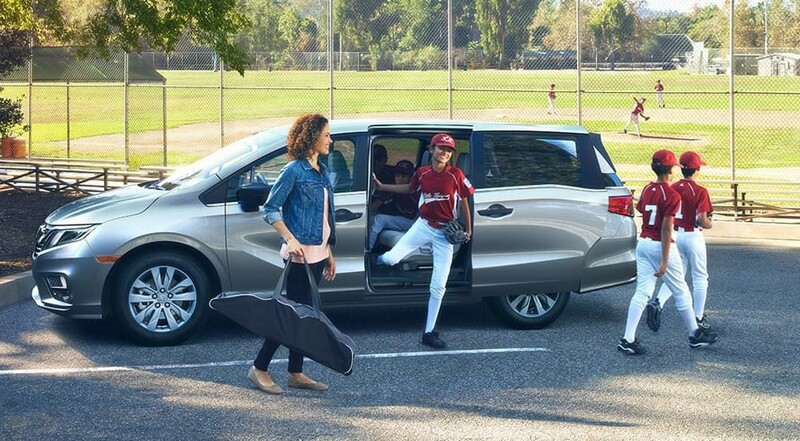 The 2019 Honda Odyssey, the latest Honda minivan, comes standard with a power adjustable driver seat and a 60/40 split-folding 3rd-row magic seat. The second and third row of the Odyssey fold down to unveil a cargo area that can handle up to 158 cubic feet of luggage. The line-leading Odyssey Elite trim adds heated and ventilated front seats, a wireless phone charger, blue ambient LED lighting, and multi-zone audio. The expansive Odyssey model line features an auto-dimming rearview mirror, leather-wrapped steering wheel, a tri-zone climate control system, and more. HondaVac: Conveniently located in the rear of the vehicle, this integrated vacuum helps keep the cabin clean. CabinTalk: Speak with the rest of the cabin with the press of a button. It even sends your voice over any connected headphones. That way your family really gets the message. On top of that, you can add a rear seat entertainment system in the EX-L trim and above, and the EX trim and above includes Magic Slide 2nd-Row seats standard. Compare the powerful Honda Odyssey to the Toyota Sienna and the Honda Pilot before visiting Brilliance Honda of Crystal Lake. If you have any questions about safety features, tech features, or Honda Odyssey fuel efficiency, contact us today. Our showroom is located just a short drive from Cary, IL, so stop by for a test drive today.